Posted on April 7, 2017 by Peter S.
When I’m walking through my neighborhood I can get a little lost in my thoughts. Somehow I tune out all hurly-burly of the busy pedestrians and delivery trucks bustling in the narrow square. I was walking like this the other day, paying no attention to my surroundings, when in my path I spotted an orange traffic cone. It stuck right out. I stopped to look around, and it’s a good thing I did. A crew of workers was dropping branches from the tree above me. 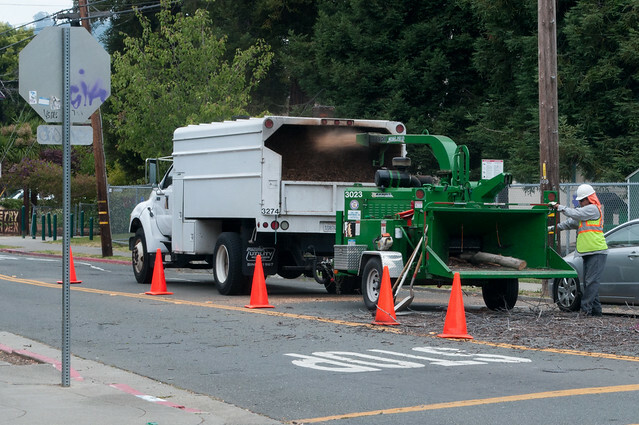 The mechanical roaring I had somehow ignored was a wood chipper eating a fifteen-foot limb from a Catalpa tree. If I hadn’t seen the cone, I would’ve gotten yelled at by the workers (and they know some colorful words). Or worse, I could’ve gotten hit by falling limb. If you manufacture traffic cones, you know that there are stringent color quality control measures to ensure that your cones meet requirements. That’s because orange traffic cones are mandated to be safety orange. That’s for a good reason: it’s an easy color to see. Orange is visible from longer distances1 then every color besides red. Also, orange contrasts readily against the natural blues and greens of sky and vegetation. It even sticks out against the duller grays and browns of the urban environment. So companies and government agencies using traffic cones have strict requirements for acceptable colors. If you fail to meet those requirements, you may find yourself in a dispute over rejected shipments. Not every cone that emerges from the injection or flow molding processes is the same color. Batch to batch, differences in base material and colorant supplies can result in mixes with off-standard colors. Also, temperature changes or differences in heating and cooling times can affect dispersion rates, resulting in uneven colorant distribution. Residue from earlier batches, and contamination in the injectors, the mixing vat, or the mold, can cause the final color to fail tolerance standards. Even within batches, uneven dispersion, disagreements between colorant carrier resins, and inefficient screw design can cause distinct variations in color. Manufacturers must implement attentive quality control processes to identify and correct any deviations before they are sent to the client. In order to run a color quality control system efficiently, it’s important to have specific tolerances to define the desired color. This CIELAB system assigns a numerical value to color, If we have a number then we can define acceptability limits. An object’s CIELAB value can be assessed accurately and objectively by a spectrophotometer, which measures reflected light. Using a spectrophotometer to measure traffic cones ensures that cones that do not meet the standard will not be shipped to a customer. Human color perception is subjective. What one person thinks matches a color sample may disagree with another person’s opinion. Lighting conditions also alter color perception; cones in a warehouse lit by fluorescent lights appear a different color than cones in bright daylight. 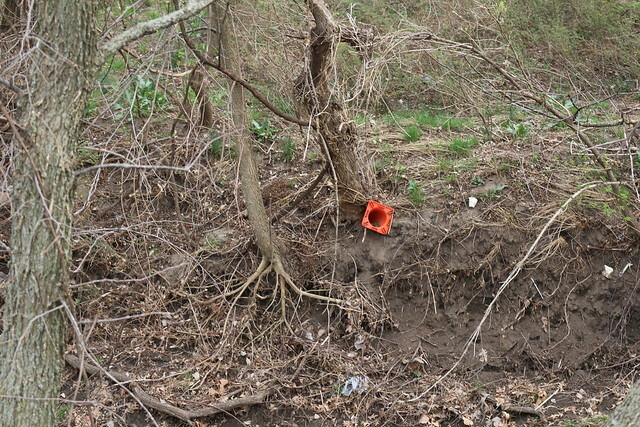 Any of these circumstances can cause human color control analysts to make mistakes, either passing off-color cones or rejecting on-color cones. A spectrophotometer controls these variables using standardized detectors and standard illumination settings, and in doing so, removes subjectivity and risk from the quality control process. Better yet, spectrophotometers can be used to measure samples of batches in process. By comparing these to previously recorded standards, manufacturers can determine if a batch will set in the right color. If the batch is off, adjustments can be made without needing to waste time and energy grinding then reprocessing the plastic into new cones. Also, having objective data improves a company’s record-keeping and self-knowledge. The reject rate can be more carefully analyzed, and correlated with data from other systems to help uncover systemic inefficiencies. More efficient systems can lead to less downtime and more capacity for orders. Manufacturers employing spectrophotometers as part of careful, attentive color quality control processes will be able to prevent off-color shipments and cut down on their reject rate. To learn more about which type of spectrophotometer would be the best choice for your particular process, contact the experts at HunterLab. With over 60 years of experience designing spectrophotometers for polymer extrusion and other industry applications, HunterLab can help you find the best instrument for your needs. This entry was posted in Color in Building Materials, Color in Plastics, Uncategorized. Bookmark the permalink.